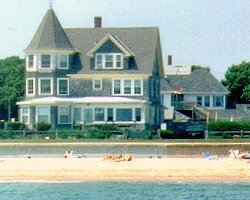 The GRAFTON INN Bed and Breakfast, circa 1880, is a completely renovated and updated OCEANFRONT Victorian. It is just 30 steps from the front door to a sandy beach. The view, whether through guest room windows or from the enclosed porch, is glorious. At night, the moon glistening and Martha's Vineyard lit up before you is magical. 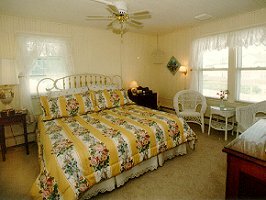 Eleven bright and airy guest rooms, each with private bath are attractively furnished with period antiques, original artwork and comfortable queen and king size beds. Overhead paddle fans gently stir the ocean air. Home-made chocolates, PM wine and cheese and fresh flowers from the Inns English gardens enhance an atmosphere of leisure and indulgence. Enjoy a refreshing swim, jog endlessly along the sea or take a bike ride. 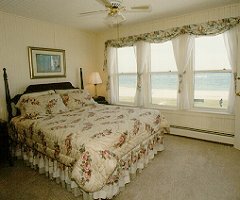 Cruise to the Islands or go deepsea fishing out of the harbor- 5-6 minute walk from the Inn. Challenge one of many golf courses - within a 5-10 minute drive. Relax and rejuvenate at the GRAFTON INN. - a special place.